Now that it’s *officially* November and the holiday season, let’s talk holiday style, shall we? While the holidays are certainly festive, fun and family-filled, they can also be incredibly busy and stressful. So many parties, things to cook, people to see, and gifts to shop for! It can really be overwhelming trying to get it all done. One thing you should never have to fret about though, is your outfit. This time of year, I rely on comfy classics like black skinny jeans, simple tunic tops and sweaters, topped off with cheerful accessories that tie the whole look together. 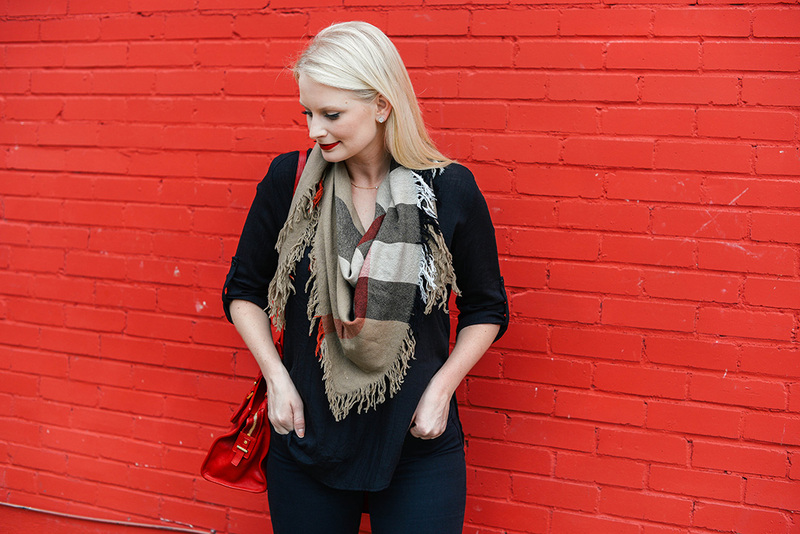 One of my favorite ways to get in the holiday spirit is with a bright red lip and a pretty plaid scarf! With the mild weather we have in Texas this time of year, it’s a no-brainer – no heavy layers, but you still get a taste of holiday flair with a small pop of red. You guys already know of my love for Burberry – they always have such a gorgeous selection of holiday dresses, chic outerwear and accessories, but this season I’m head over heels for this scarf. The neutral backdrop provides the optimal landscape for just a sprinkle of holiday red, don’t you think? It looks amazing with my nearly all-black and camel fall/winter wardrobe, but looks tasteful and elegant against winter white too. This scarf perfect topper for the holiday season to dress up your everyday casual basics. PS – don’t forget about Burberry for holiday gifts. So many fab stocking stuffers like this gold leather card case, these tortoise sunnies, and this elegant wrap watch. love this lip color on you and this scarf really is gorgeous. My mind is definitely in holiday mode! Love this outfit! Gorgeous scarf! I love the look. Makes me excited for the holidays! 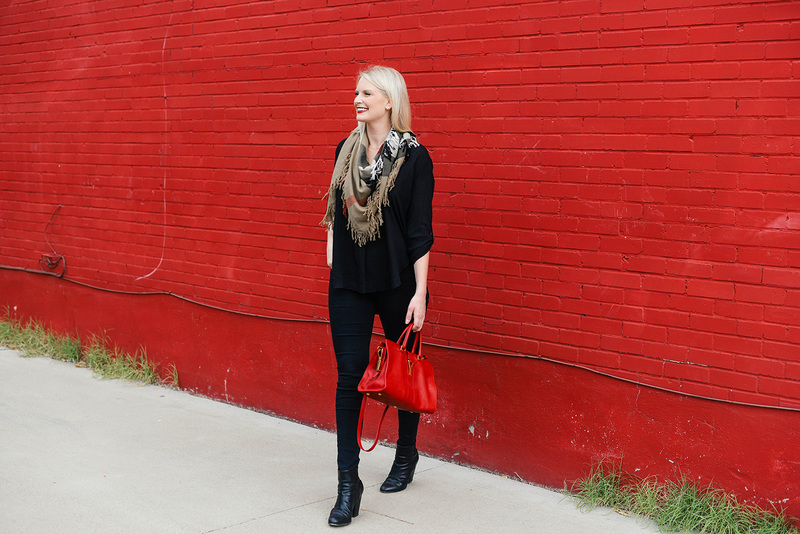 Oh this pop of red – such a great look! Love the bag! 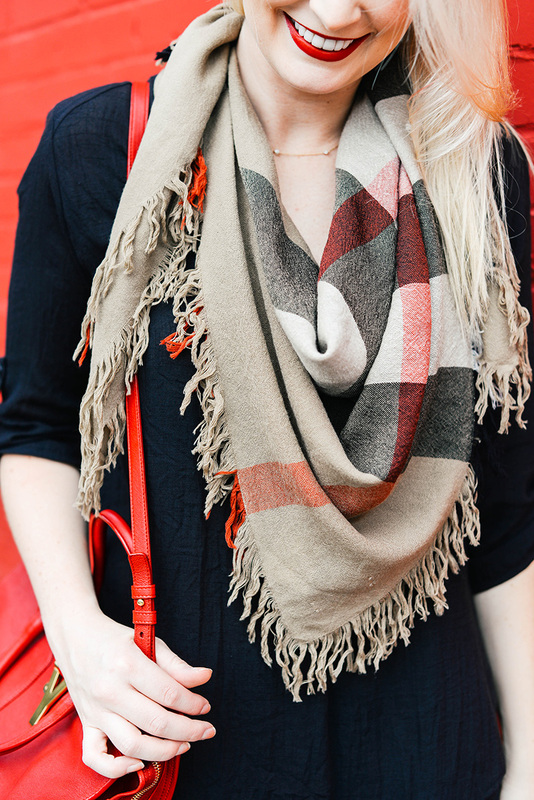 Yes, nothing like a burberry scarf to add instant holiday vibes to a casual outfit! Love this look! The scarf is so pretty! 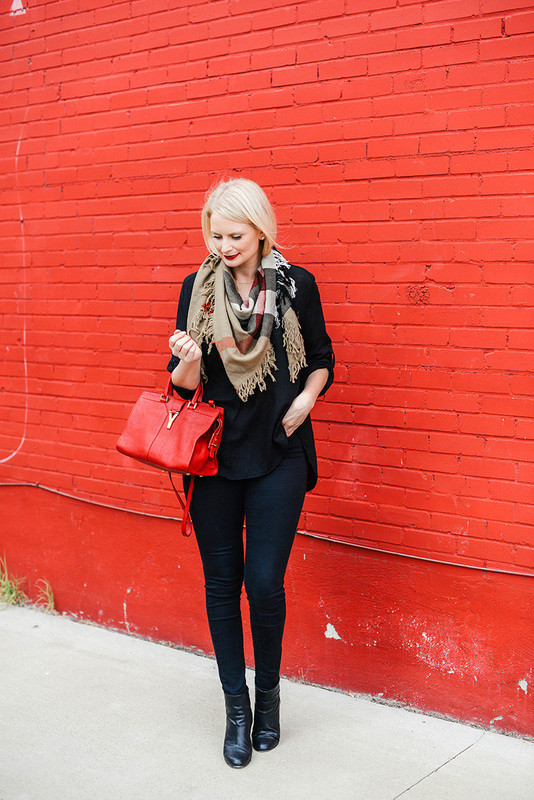 Love how your scarf, red bag, and lip really transform this all black base into a perfect holiday outfit! love this easy yet totally chic look — and it also looks comfy!